The Kutai dance art is divided into 2 types: Folk Dance Art and Classical Dance Art. Jepen is Kutai folk art which is mostly influenced by Malayan and Islamic culture. This art is very popular around people dwelling in riverbank area of Mahakam or in coastal area. This gathering dance is usually performed in pairs; however, it can be played in single. 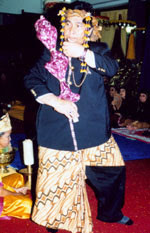 Jepen dance is accompanied by song or special music of Kutai called Tingkilan. The musical instruments consist of gambus (a kind of six-strings guitar) and ketipung (a kind of small drum). Because of the popularity of this art, almost every sub district has its own Jepen group and also Tingkilan with its own unique style. Therefore, this dance develops rapidly which is proved by the emergence of new creations such as Jepen Tungku dance, Jepen Gelombang Dance, Jepen 29 Dance, Jepen Sidabil dance and Jepen Tali Dance. Sacrificing Dance In the past, this dance is performed by royal women of Kutai Kartanegara, however, nowadays it can be performed by any women. The dance which is accompanied by gamelan music is specially dedicated to welcome guests in an official ceremony. The dancers is not limited, the more dancers is better. Ganjur Dance is royal man dance which is performed in pair using the equipment called Ganjur (a club made of cloth). The dance is accompanied by gamelan music and is performed at royal coronation, marriage, guest welcoming, birthday and circumcision of the royal family. This dance is mostly influenced by elements of Javanese dance (Yogya and Solo). This dance is rather similar with Ganjur Dance, only it is performed by man and women with rather agile movement. The dance composition is rather free and does not follow certain patter that it could be compared to gathering dance. In its performance, Kanjar Dance usually initiated by Sacrificing Dance because this dance is also performed to honor the guests and is also used as gathering dance. Historically, this dance has relationship with Singosari and Kediri Dance, however, the movement and gamelan music accompanying the dance is rather different. While, the story in the dance and also the costume is not too different. Kutai Mask Dance is only performed at royal environment, for entertaining the royal family. The dance is usually performed at king coronation, marriage, birthday and royal guest welcoming. The dance is performed by head of Ponggawa using a bow and five-headed arrow. The Ponggawa circling the ceremonial site while winding the bow up and down, and uttering the mantra in a hope that gods will dispel evil spirit and bless the peace, fertility, and prosperity for the people.